Review: Western Digital MyBook 6TB Studio Edition II - iPhone.MY - Daily News On Mac, iPhone, iPads, iPods and more! I remember spec’ing out an Apple XRAID a few years ago which I filled with 14 400GB hard drives. At the time, it was the biggest and fastest volume I’d ever built. After putting those drives in RAID 5, I had around 2.4TBs per side. If memory serves me correctly, that rig cost around $15,000. …this external drive may be what you are after. Read on for the details. The MyBook Studio Edition II comes in a foot cube box and is the same size as most dual 3.5 inch hard drives out there. This one however, is the first with two 3TB drives inside. You’ve either got a massive 6GB RAID 0 striped volume (which is the default shipping config.) or two redundant 3TB drives in a RAID config. The packaging includes a AC power (with UK adapter), a USB- mini USB cable and Firewire 400 and Firewire 800 adapters. The enclosure is plastic and isn’t going to win any design awards. The drive also has a eSATA port but my eval unit at least didn’t come with an eSata adapter. That’s fine, most Macs won’t have a use for it. Installing the drive is dead simple which is great for novices. It comes pre-formatted HFS+ RAID 0 which means you’ll have 6TB of space with which to work. The default Mac setup is notable here. PC users will have to format it to FAT32 or NTFS. The downside of Striped RAID 0 is that if either internal drive fails, you lose all of your data. That means you have double the probability of losing data as a normal drive – and that’s not something that everyone is comfortable with. For some people who use this as a non-essential disk space however, this works fine and you can be on your way. However, with this drive, you can also configure it as a RAID 1 redundant drives which might be better for important data. That means both drives store mirror images of each other. If one drive fails, your data is still safe. With a RAID 1 configuration, you have a much less likely chance of losing your data. To do this however, you’ll want to install Western Digital’s Drive Manager software which comes on a CD in the box before you plug in your drive. Once installed, plug in the drive and you’ll get a tray item at the top right of your screen. Select it and launch RAID Manager. From there you’ll have 4 options. Mac users will likely want to pickRAID 1 HFS+. The drives will re-format for the new configuration. For me it took about a minute. The new 3TB drive pops up on the screen and you are ready to go. The first Mac I tried this on was a 13-inch 2.4GHz Core Duo MacBook Pro with a Seagate 7200RPM Hybrid SSD/HDD internal drive and 4GB of RAM. The backups and file copying over Firewire 800 were about as fast as I’ve seen. 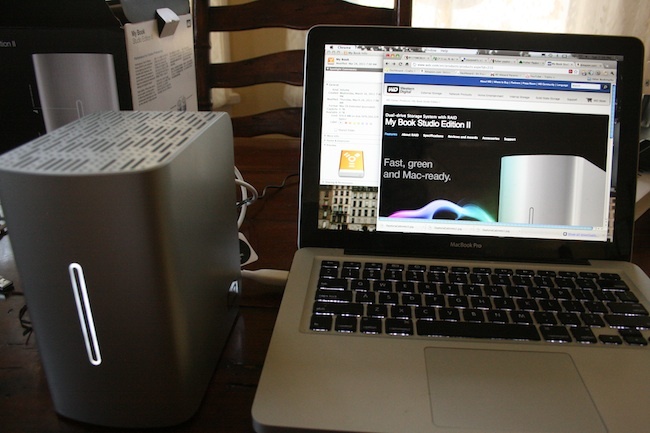 However, the bottleneck was likely in the local drive speed and the Firewire 800. Later, on last year’s iMac 22 inch, I tried the drive and it performed reasonably well. I use a 7200RPM Seagate Firewire 800 external drive and it pretty much matched performance. 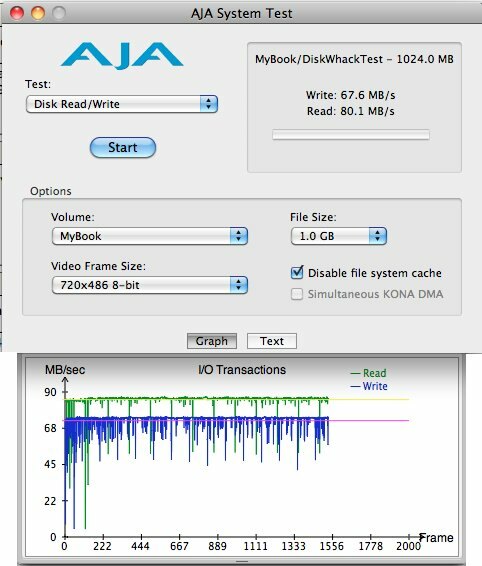 Here is the AJA Disk Wack results which pulled in a respectable 68MB/s write and 80MB/s read. While this is fine for a pro-sumer, it isn’t going to give professional video editors the kind of speed they crave. For those people, a SATA 3 RAID card/Enclosure will probably be a much better, though expensive choice. In fact, popping these drives out an putting them into a Mac Pro would even be a better option for speed freaks. I also took the drive apart to see what is inside. Though I wouldn’t recommend this to novices, it is pretty straightforward and easy to get back together. To open, stick a small object (I used the included AC adapter) into the top like so). Check the gallery below for the goodies. For me and the general public however, this is a pretty good way to easily get 6TB of space. At $550, I feel like there should have been a NAS Gig Ethernet option. If this is what you are after, it is easy enough to Plug into an Airport Extreme, Time Capsule, PogoPlug or any other USB-NAS adapter. The price is also significantly higher than purchasing two separate 3TB External drives – which can be found for as little as $150/each. It is plenty fast for 90% of users, including pro-sumers who want to offload lots of video data. The internal 5900 RPM drives are very efficient (WD says they use 33% less power than normal 3.5-inch drives) and the enclosure also has aggressive power management features. Idling, these drives use less than 1 watt of power. 6TB of space in a $500 box? Not too shabby. Wrap up: It you want to add 6TB of storage to your Mac (or even a redundant 3TB of storage) it is hard to argue with My Book Studio Edition II 6TB. While 10% users will either opt to build their own or get a faster package, the majority of the middle will be happy with the moderately fast, efficient easy setup that Western Digital offers. The drive is available at Amazon and other retailers for $550-ish.